Mind on Movies is very excited to announce that we are working with Universal to giveaway Pitch Perfect 3 on Bluray! Now graduated from college, the fabulous Bellas of Barden University are back for one last call in Pitch Perfect 3. 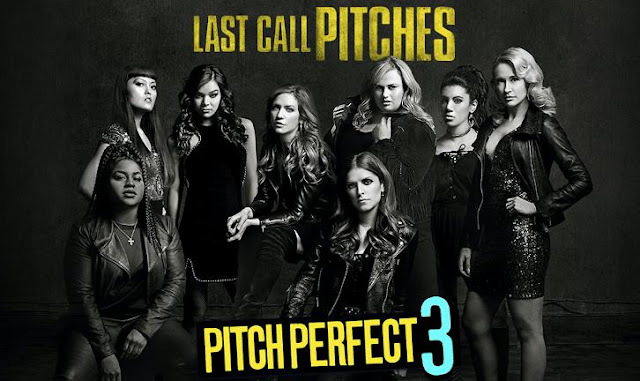 Beca, Fat Amy and the rest of the Bellas are off to face a post a cappella champion world in the high-spirited closing act to the franchise that sparked a worldwide phenomenon. Pitch Perfect 3 arrives on Digital on March 1, 2018 and Blu-ray™, DVD, On Demand and and via the all-new digital movie app MOVIES ANYWHERE on March 20, 2018 from Universal Pictures Home Entertainment. Filled with all-new musical performances, a hilarious gag reel, never-before-seen deleted footage and more, the exclusive behind-the-scenes bonus features make Pitch Perfect 3 a must-own film. Pitch Perfect 3 is available on Digital March 1, 20184K Ultra HD, Blu-Ray™ and DVD on March 20, 2018. Loading... No Purchase Necessary. Only one entry per mailing address per giveaway. The prize will be sent via FedEx or UPS. No P.O. Boxes please. This contest is from Mind on Movies working with UNIVERSAL PICTURE HOME ENTERTAINMENT. The entries will be checked. CLICK HERE to join our Mind on Movies Email List.